In 1995, Pixar released Toy Story, and it couldn’t have dropped at a better time. The Disney Renaissance had peaked the year prior with the Lion King, and although no one knew it yet, the Eisner era had already begun its slow decay and collapse. Toy Story had a hellish developmental cycle — the script went through several rewrites, Disney shut down the production at one point, and even late into its production cycle, there were several key Disney executives who were not on board. But it emerged, finally, as a groundbreaking, acclaimed film — it ushered in a new era of CGI animation and was proof that something other than a princess musical could be a crossover hit. With the following Toy Story 2 and Toy Story 3, the trilogy has become a beloved touchstone for a generation’s childhood — the same moviegoers who saw 1 as kids were the same moviegoers who cried as adults during 3. Those moviegoers saw their innocence thrive, and then die onscreen, in the most heart wrenching manner possible. 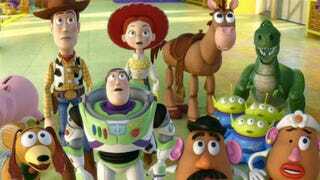 Here are six times that Pixar went too far with the Toy Story trilogy. And let’s pray that the upcoming Toy Story 4 won’t constitute number seven. At least for younger Toy Story fans, Sid is the de facto villain of the first film — a destroyer and torture expert of innocent toys. He even has a cliched, ‘moustache twirling’ scene at the beginning, when he blows up a toy and does a little happy dance. But as we grow older and stop taking what we see at face value, we begin to view Sid in a different light. The viewer receives evidence, both implicit and explicit, that Sid is really just an unhappy kid — his house is unkempt and messy, and his parents seem neglectful and hands-off in their childrearing. But Pixar buried Sid’s complexity too deeply. All of the other Toy Story villains’ traumas were made explicit beyond background context clues, and Lotso was even given a shot at redemption (though he didn’t take it). Instead, Sid runs away from Woody traumatized, and we’re supposed to cheer. Most importantly, Sid didn’t know his toys were alive. Had he known, then yes, Sid would be a monstrous sociopath. But let’s be real: what child hasn’t played rough with his or her toys? One might even consider it creative to do what Sid did, which was to combine his toys into something of his own imagining. Sid is only cruel because of what the audience knows; plastic is a far cry from flesh, and it’s not like the kid was blowing up small animals in his spare time. RC is an underrated, key character in the first film. He actually sets the entire “Lost Toy” plot in motion, when Woody inadvertently uses him to knock Buzz out the window. At the close, RC also resolves the film’s conflict, in a way that’s thrilling, but illogical. RC manages to not only outrun a healthy, angry dog, but also manages to keep pace with a massive, moving truck. It made for a great chase scene, but it was definitely a bit much, even for an animated film. A common counterargument to this is that the RC Car, as an autonomous thing, simply pushed itself harder — that the top speed that accessed by the remote control isn’t its actual top speed. Fine. But if that’s the case, then why is it so dependent on batteries? All the other toys, after all, are able to run and flip without the benefit of a power source. There is no three-dimensional, well-realized female character (with the possible exception of Jessie, and even she’s sort of a stereotype). Bo Peep is essentially a trophy to be fought over, and Barbie is a one note joke. If Pixar must make a Toy Story 4, they should consider incorporating a well-realized female toy to give the cast some needed balance and perspective. But in Toy Story 3, she has become just another sidekick to Woody and Buzz’s shenanigans. Pixar missed a key chance to make the dynamic duo into a trio. Lots of times, Jessie is just moping around or going with the flow, rather than taking definitive actions to pursue her goals. She doesn’t even get her own action scene in the final film, even though she’s Buzz’s physical equal at the end of Toy Story 2. It’s getting to be routine and cliched; Buzz isn’t himself, and the gang has to flip his switch, or spot his decoy, or snap him out of it to reach their goals. It’s the problem of multiple sequels — eventually, entire plotlines get recycled, and the protagonist learns the same lesson, all over again. It’s reminiscent of bad Star Trek: The Next Generation episodes; whenever the writers got lazy, they just had Data malfunction and nearly kill everyone. Or how about the Shrek franchise, where Shrek learns at the end of every movie that he’s more than just an ogre? Ogres may not be vicious, mean creatures, but they’re certainly forgetful. Surely, Buzz isn’t the only toy that could malfunction in humorous ways. In the past, the Toy Story creators let the antagonists off pretty easily. Sid will probably need therapy, but at least he’s alive (and later becomes a gainfully employed sanitation worker). Prospector Pete might not like makeup and lipstick, but he’ll be loved by his new owner, for better or for worse. This is, after all, a kids’ franchise. But Lotso? He gets tied to the front of a truck to be dragged through bugs and the elements, along whatever journeys the truck is scheduled to make. Eventually, if he doesn’t get tossed into the trash at a truck stop, he’ll probably just break apart and scatter across the highway. As evil as he was (and he was definitely evil; he left the gang to burn in the incinerator), Lotso was also a damaged soul. And it’s hard not to feel sorry for a bear who smells like strawberries — especially when he’s about to smell like truck exhaust and mold instead. 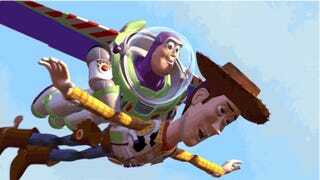 When Buzz detaches from the firework at the end of the movie, he flies. No, he doesn’t ‘fall with style.’ He actually freaking flies, and does a parabola right under the telephone wires. It completely undoes a prior scene’s poignancy. It’s that scene when Buzz attempts to fly out Sid’s window and breaks his arm, because wishing for something doesn’t make it come true; a person has to be satisfied with what he or she is. But by having Buzz actually fly in the end, Pixar took that very adult, poignant lesson, and threw it in the garbage. The audience is thus left to assume that he didn’t fly the first time not because he had limitations he had to accept, but because he didn’t want it badly enough. Or because of some sort of ‘miracle,’ which is even lamer. It might seem silly to demand logic in a movie where toys are secretly coming to life, but that’s sort of missing the point; a movie should adhere to its own internal logic and rules, and this particular scene did not. Kevin is an AP English Language teacher and freelance writer from Queens, NY. His focus is on video games, American pop culture, and Asian American issues. Kevin has also been published in VIBE, Complex, Joystiq, Salon, PopMatters, WhatCulture, and Racialicious. You can email him at kevinjameswong@gmail.com, and follow him on Twitter @kevinjameswong.